For each member of the human family, symbols, stories and traditions are cast into a crucible from which unique standards of freedom emerge. My HOLDING PATTERNS series, inspired by Domesday Book, responds to the Who Holds/Who Held records of this 1086 property inventory, a survey of the Norman Conquest impact on England. Between the lines of statistics are the stories of those displaced by political, economic, and cultural upheaval. This excerpt from the series gives voice and presence to the slaves of Surrey who were counted but unnamed at the time. Their owners’ names are stated in the Domesday text. 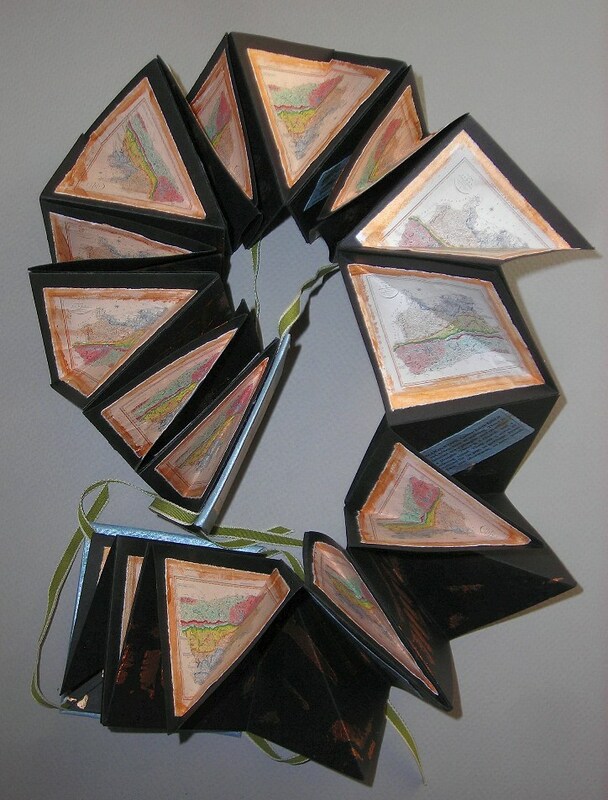 I used a chained version of an accordion structure for this artist’s book, juxtaposing the map of Surrey with altered Domesday pages that include the slavery records. The altered geological map of Surrey, used by permission of the Geological Society, was created in Victorian times. Like ours and that of Domesday it was a time when for many , freedom could only be imagined. Inspired by the book “The Miracle Hater” by Shulamith Hareven. “War Paint” is about my journey . I am a warrior against my adversaries. I eat the bread of affliction and it nourishes me so I can continue to fight on. Last year I was a slave but this year I’m a free man. Every stroke of the brush and every letter written gets me one step closer to achieving my goals. War Paint is intentionally incomplete to signify that our journeys are a lifelong adventure. To be free is to happily eat the bread of affliction and fight on. 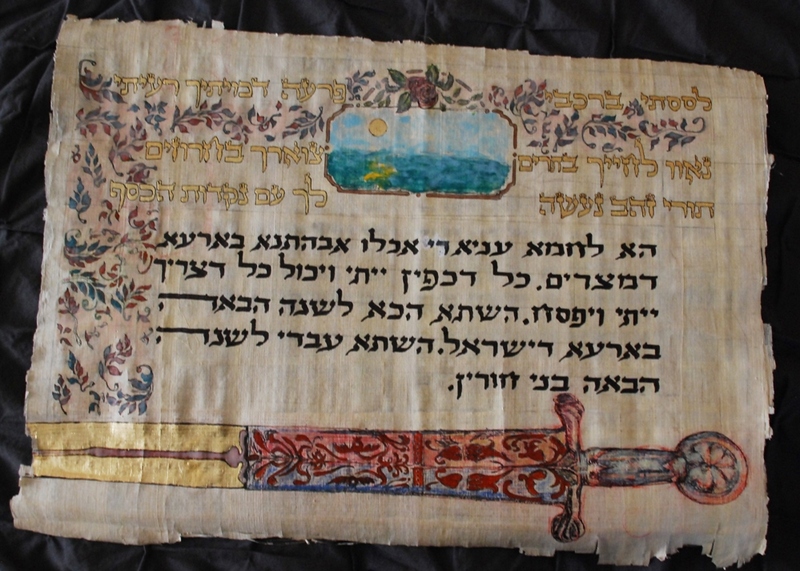 The Hebrew writings are from the Passover Haggadah. The hagaddah serves as the script for the seder and allows for conversations about stirrings for freedom. Passover is always a time to stop and remember what freedom means for each one of us. These time cans until today are symbolizing for me the fight for freedom by reminding me what price was paid for my own freedom and freedom of million Jews who made aliya to Israel from former Soviet Union during the last 20 years. At a special dinner called the Passover seder the story of the exodus of the Israelites from slavery in Egypt is told in many ways. One telling of the story spans the entire length of the seder, punctuating the seder four times with the drinking of wine. The four cups of wine are linked to four promises of redemption in Exodus 6:6-7. Each promise is ever more elusive and liberating. Each promise demands more empathy, more trust, more courage and more imagination to believe that freedom is possible. And the wine helps! Reworking the Haggadah’s “The Four Questions” and the ritual of drinking four cups of wine, this poem offers American answers to questions of injustice. At the end it becomes a prayer that America will always have another cup to offer all those who are in need of Freedom. For the text, click HERE. As members of my immediate and extended family have died in recent years and my generation has become the older generation it has given me time to reflect on their lives and how it has impacted on mine. 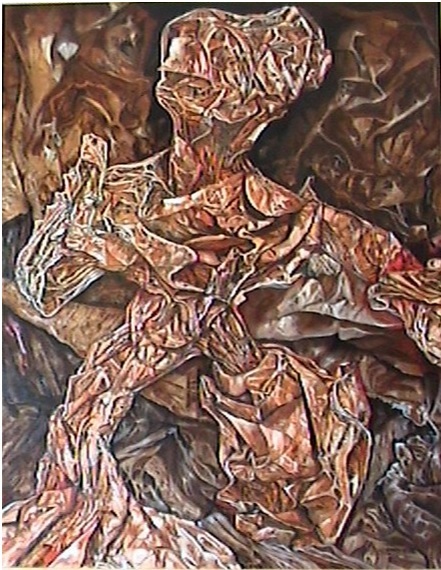 This series called “Mishpacha” (family) has been the focus of recent work. My parents were born in Germany and as young adults escaped in 1939 and came to the United States. Being part of the first generation born in America has influenced the way I think and feel about freedom. Although we never spoke of it formally, freedom was not taken for granted. The shadow of family that did not survive the Holocaust has always lingered around the edges of my life. At the same time the opportunities that were afforded the survivors were never taken for granted. 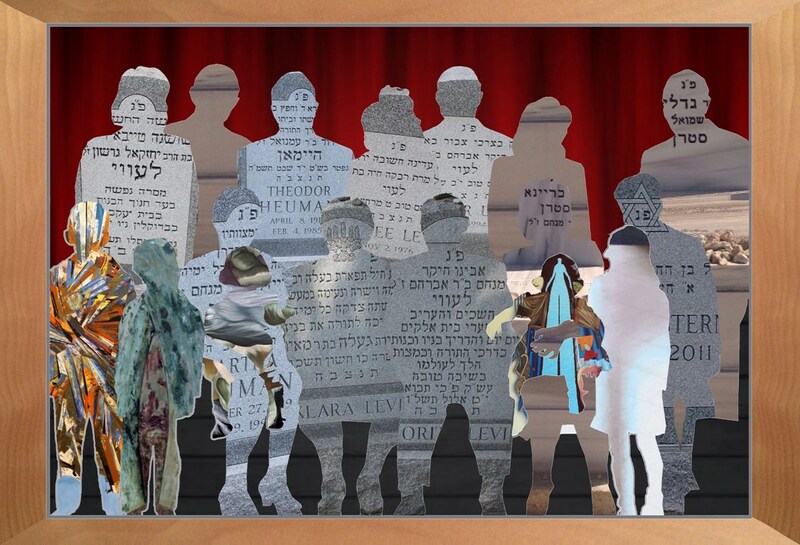 The art submitted here shows silhouettes of family members super imposed on their gravestones. Rotating through the exhibit, each image some form of life and freedom. In Mishpacha III the figures in bright color represent life that continued to blossom despite death and the hardships the former generation had to endure. In Renee and Arthur, my aunt and uncle stand and sit in a convertible. In the US the image of a car is clearly a symbol of freedom and prosperity. The use of a theatrical stage and curtains in some of my pieces represents the drama that most families experience. Here the drama of past generations continues to flourish with the new generation born and raised in freedom. These art works show what appears to be written language. The languages look real but they are made up languages that allow freedom of expression according to the viewer’s imagination. The origins of this art are photographs of the Ammonite wall in the Ramon Crater in Israel. This natural crater was under water millions of years ago. What is left of this ocean are spiral ammonite fossils embedded in the walls of the crater. Manipulating these photographs, I created several alphabets that look like language. The irony is that I created a language of free imagination based on creatures trapped in stone. In the United States freedom of speech is a basic freedom we mostly take for granted. In many parts of the world that freedom is frozen like the ammonites at Ramon Crater. 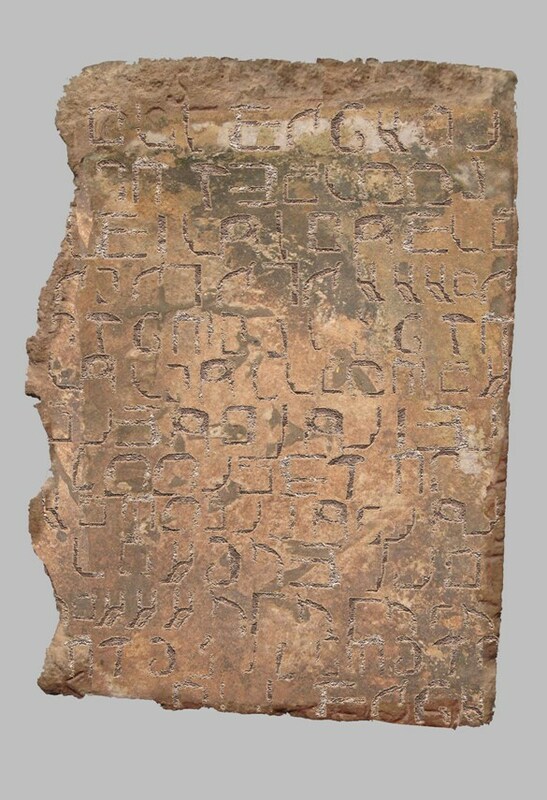 Through this art I have attempted to create languages that have no boundaries or restrictions whether scratched in stone, calligraphed on silk, penned on parchment, or magnified on billboards. The desire to express oneself in written language is a fundamental human characteristic. We should celebrate our right to this freedom and strive to help achieve it throughout the world. 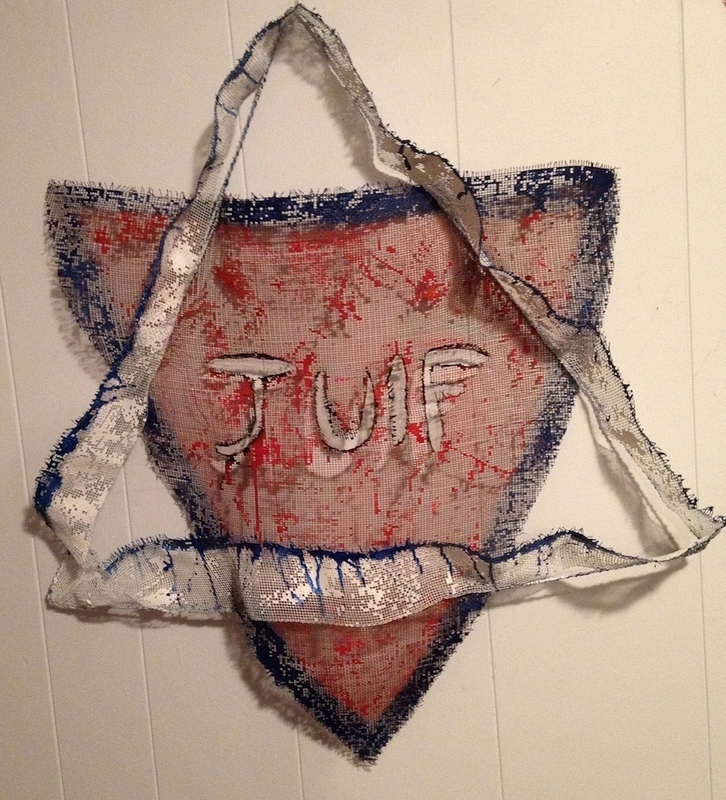 I was tearing wire mesh in shapes of the letters J-U-I-F, a symbol to ‘Kriah’ and a reminder to families that were torn apart. Star-JUIF is part of wall installation: SCAR OF DAVID a painful wound in the Jewish History; during the holocaust Jews were forced to wear ‘yellow stars’ as a symbol of hatred, nowadays Blue Star of David is the premier Jewish symbol, center of the Israeli flag. My wire mesh Stars are not perfect, emphasizing the idea of accepting differences in people, we don’t need to be perfect, we better be humane. Kriah refers to the ritual of tearing a mourner’s garment as a tangible expression of grief and anger at the loss of a loved one. I am a social worker, supervisor, Fatherhood Initiative state wide coordinator and an artist. I use the discipline of drawing to express awareness of our ever changing society and our responsibility to contribute to that society. This painting recognizes those who reach beyond themselves for its betterment, who fight for its Survival, fight so that we may all have our freedoms, protected and enhanced through our struggles. I am an Ukrainian, Russian Speaking Jew. For the last 10 years I have lived in many countries, however most of the time I have lived in Ukraine, Israel and Nepal. These are countries where the idea of freedom is a source of longing and many people sacrifice their lives for it. 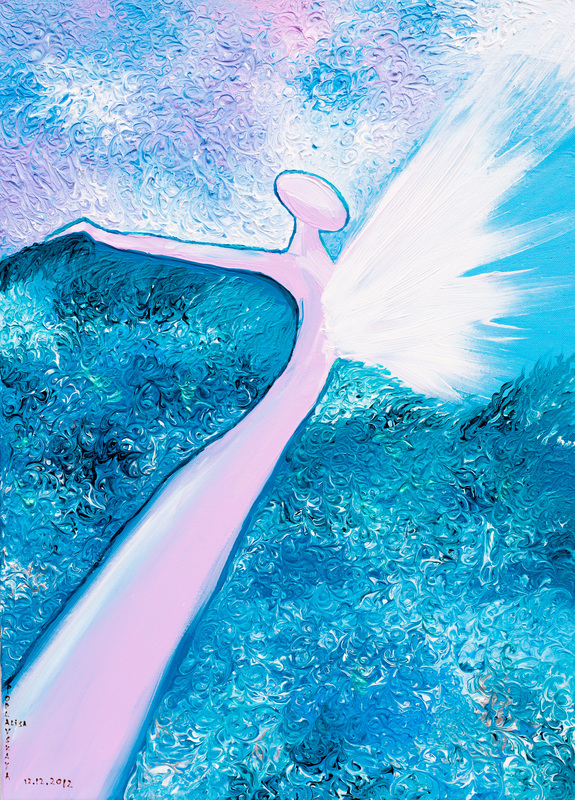 I had been reflecting about freedom for 15 years until on 12.12.12 at 12:00h I had an illumination which resulted in the painting “Freedom Flight”. Freedom is the highest concept of human spiritual development and growth. To be free means for me not to be attached to anything, to fly ahead without turning back, the desire to be light and become pure. I call it Freedom flight because it is without any weight of regrets. 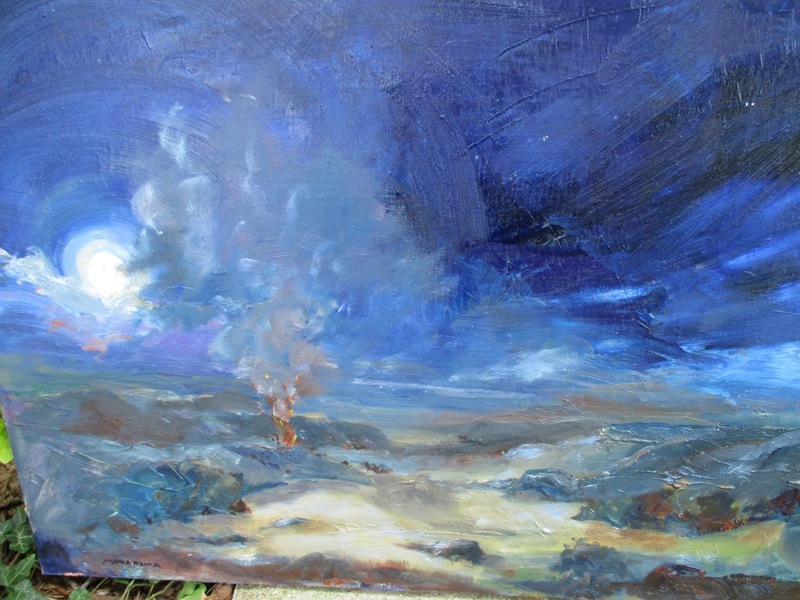 The painting was created in a feeling of complete harmony and calmness. On the painting there is a genderless and faceless soul. It is free from all earth related matters and driven by the light which is coming out of it. And it follows it freely, this is the “freedom flight“. The colors in the painting represents lightness, purity, brightness, energy waves and aura. What love wants most for the other is freedom, and receiving love is the pathway to freedom. Although it may feel as though we can grow in our capacity to love, the capacity to love is the unchanging essence of what makes us human. Instead, our limitations expand so that the capacity that was always there can be more fully realized. Only the most exceptional persons (Jesus for instance) become fully free from these limitations here on earth, so growing in freedom is a life-long endeavor. As we receive more deeply the love that is offered from God (mediated in myriad ways), we become freer from ego, insecurity and fear, and freer to connect, accept and forgive. To become freer, we must become vulnerable and open to receiving the love that is constantly offered. 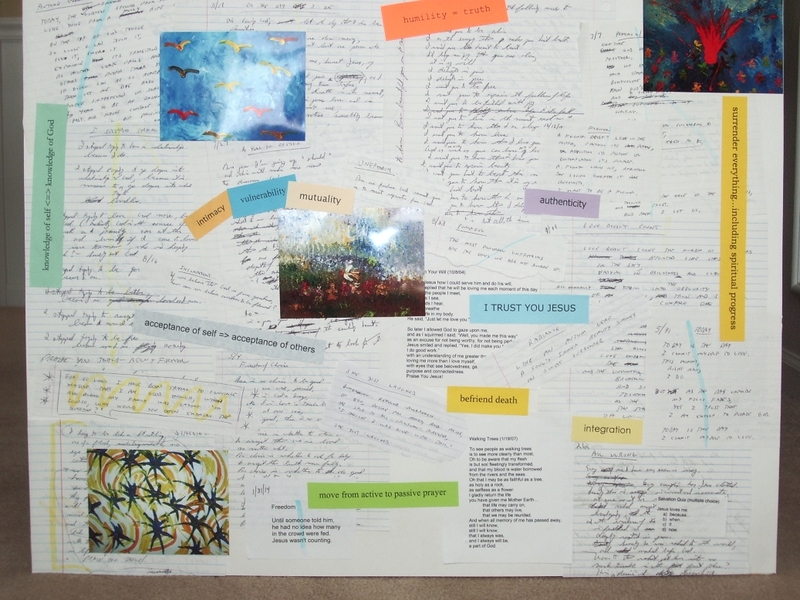 This collage is of original journal pages over eleven years and photographs of my paintings.